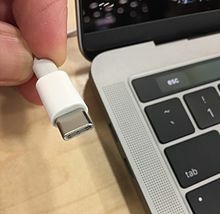 Thunderbolt 3 (40 Gbit/s) Alternate Mode with cables longer than 0.5��m requires active USB-C cables that are certified and electronically marked for high-speed Thunderbolt 3 transmission, similarly to high-power 5 A cables. These cables are marked with a Thunderbolt logo on both ends. They do not support USB 3 backwards compatibility, only USB 2 or Thunderbolt. Cables can be marked for both Thunderbolt and 5 A power delivery at the same time.